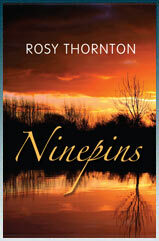 Book Review: Rosy Thornton's "Ninepins"
Home » books » review » Book Review: Rosy Thornton's "Ninepins"
This is the first book I have been sent to review for this blog from an author I don't know, rather than one I just happen to have picked up and liked enough to write about it, or a friend who has written a book. I always tell people that I can't promise to review a book here because if I don't like it, I'd rather not write anything about it. Thankfully, I did very much enjoy Rosy Thornton's fifth novel. Ninepins tells the story of Laura and her twelve year old daughter Beth, whose lives are changed by the arrival of seventeen year old Willlow and her kindly social worker Vince. When Laura rents out the pumphouse, she does not expect to become so involved in the life of Willow, a withdrawn, vulnerable young woman who spent many years living with her mentally ill mother. Little does she know that Willow's past has the potential to shake the very foundations of their lives. This book is an interesting exploration of a difficult relationship between mother and daughter, at a time when Beth is on the cusp of adolescence. Thornton successfully conveys the line between a girl's school and home life, from the perspective of an anxious mother. I felt it gave me real insight into a parent's worries as their child begins to demand more freedom. Plot lines involving Beth and incidents at school were accurately described and evoked memories of my own transition from primary to secondary school. The reader goes through a very real journey with Laura, as she learns that her relationship with Beth is not as problematic as she sometimes feels. Simultaneously, it is through watching Laura and Beth together that Willow begins to realise what a family has the potential to be. Thornton writes vividly, in a wonderful descriptive style that evoked a powerful sense of place while I was reading. I fled through this book in just a few days, and the story is well-paced, well structured, with interesting, thoroughly believable characters. If you enjoy books about the subtleties of human relationships, this is one for you.